Seiff restricted publicity to e-mailing churches and various interfaith contacts because, she said, minority groups must consider safety first. Although the "crummy weather"; cut the ceremony by 15 minutes, Seiff said they never thought about moving it inside. Roc Linkov, the treasurer of Am Shalom, a Reform Jewish congregation that meets in a building behind the square, said it was heartening for him to celebrate Hanukkah in a communal setting despite Bowling Green being "a little sparse for us. "; Linkov and his family moved to Kentucky from New Jersey two years ago. Toby Black, another Am Shalom congregant, agreed with Linkov's summation and said the event should heighten people's awareness of area minority groups. Susan Bell of Madisonville facetiously said she came to behold "the first public menorah lighting in the South. "; Her husband, David, said the gathering was a "throng by comparison"; to other Hanukkah ceremonies. They found out about it by virtue of a Jewish student group at Western Kentucky University, where their daughter graduated six years ago. Operating under breezy conditions, Seiff asked for volunteers to shield the candles while she fired up the couple's two menorahs. She said they often have to drive to Nashville for religious supplies because of Bowling Green's modest Jewish population. The group bunched together - protecting the candles and warming each other - as they sang traditional Hanukkah songs. 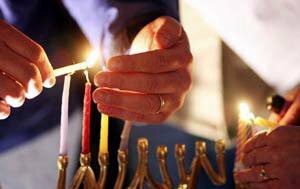 Seiff said the fourth candle was lit Wednesday, corresponding to the fourth night of the festival, and the center "shamas"; candle, meaning "servant"; in Hebrew, is used to light the others. The ceremony beckoned a gamut of Jewish-Christian relations. Jane and Larry Pearl, members of the Messianic Jewish Beit Simcha congregation on East 10th Avenue, said they came to support the effort. They said their congregation, which also has a menorah displayed in a window, believes that Jesus fulfilled numerous Old Testament messianic prophecies. The only difference in their lighting practice, they said, is that the shamas symbolizes "Yeshua"; - Jesus in Hebrew - to them. Susan Bennett of Bowling Green and her husband are Christians; however, their 24-year-old daughter, Hannah, with whom she attended the ceremony, converted to Judaism a few years ago, around the time she dated a Jewish boy. "She's a much better Jew than we are Christians,"; Bennett said. Hannah Bennett, reflecting on the experience, said Bowling Green is a small community that is finally starting to celebrate other cultures. Laurie Joyce, who attends Christ Episcopal Church in Bowling Green, said curiosity led her to the ceremony. Combined with the sweet memories, Seiff said she expects more participants next year because of Hanukkah falling earlier in December. Members of the Bowling Green area Jewish community participate in the lighting of a menorah Wednesday at Fountain Square Park. Wednesday was the fourth night of Hanukkah. Some things work out well. Thanks for all your warm support. Check out this news article for more details if you're interested. Well, I'm in recovery from a bit of outpatient surgery (everything is fine, thanks) but I'm sore and bruised and all that. My nice mom came to visit in case she was needed. In the end, I spent several days absolutely drugged up, recovering from anesthesia and sleeping and eating. Husband helped, Mom helped, and then, Mom listened to books on CD and knitted. Mom knitted an entire Knitty Satchel for me and a scarf of her own design. The satchel is for my birthday on January 5th so Mom took it home to Virginia for felting. I'm gearing up for the big Celebration on the Square and hoping it won't rain. Also hoping that some people show up. I had a reporter contact me and I encouraged him to do a nice write up after the big event rather than before... I'd like to protect the participants as much as possible, so I'm avoiding publicity or advertisements. It stinks to have to be this careful but I know it's necessary if I want a peaceful event. One strange result of planning this event happened on the 25th. We got this phone call from a complete stranger-she said, "My college-aged daughter is in town. She is a recent convert to Judaism and is looking for a place to celebrate the first night of Chanukah. Do you you know of any public celebrations?" Of course, there are no public celebrations here other than the one I planned for later this week, so we invited her over to light the Menorah and have latkes for dinner. It was very fun to meet her and she has a brave and supportive mom! This is the good side of living in a small city...you can never tell who will get in touch with whom and give you a call. On the knitting front (oh, yeah, the knitting and spinning stuff?) I've been doing a bunch of swatches to submit to knitting publication deadlines in early January. I've had a lot of designs rejected lately, so I'm trying to look into submitting to a wider variety of places. It's hard to keep up a positive attitude sometimes when you get a lot of random rejection. Plus, it's not like I get paid a ton to do designs; it's just that I find them a fun part of my overall freelance work. I've been thinking about doing some self-published designs, but I'm not quite there yet-technologically and professionally. I did however spend part of the morning emailing with the editor of KnitNet, who wrote THIS. Wow, what a great way to upset potential advertisers and lose subscriptions! 1. Everyone makes mistakes...editors, designers, writers, graphics, everyone. The magazines and books definitely do. 2. Blaming one segment of the knitwear design industry for writing poor patterns is very bad form. 3. Knitters need to own some of the responsibility too--not every knitter is up for every pattern. If they have problems with a pattern, they need to email the designer or the magazine, ask a friend, work out a solution or admit defeat. It happens. I've certainly done all of the above. I get emails from knitters all the time, too. I think knitters are smart people who can problem-solve. I believe in knitters, but I believe in designers and editors too. Everyone makes mistakes...and everyone should own up to theirs, and fix them, as best they can! First, thanks to everyone who said kind and comforting things about Bubbe. I so appreciate it. I have debated a lot about this blog. Is it strictly about fiber? About my writin' life? About my movie star dogs? Really though, it's about whatever I want it to be. I'm prompted by Stephanie aka the yarn harlot to tell you about my recent, ummh, triumph. Worse yet, it took quite a while for them to acknowledge that the Nativity scene, the "Celebrate Jesus and America" Independence Celebration, the Dogwood festival (don't ask) --that all these things were indeed Christian events and that by allowing these "traditional things" (their words, not mine) and not allowing Jewish, Muslim, Hindu, Wiccan, etc. events, they were, in essence, privileging one religion above the others on the town square. Finally, a nice man who happened to be the Midwest civil rights counsel of the Anti-Defamation League advised me that I had to file a formal request, cause if the city turned it down, then we could do something like legal action. I did the request. So, even though I'd really prefer no religion at all on the town square, (that's what churches, mosques, synagogues, and temples are for, imo) I filed the request. It was approved, although at least one city official let me know that he saw it as something so out of the ordinary that it really put him out. (How dare I, a fourth generation Jewish American, exert my constitutional rights?) I am putting on a one hour Menorah lighting and Celebration of Religious Freedom, complete with singing and doughnuts, on December 28th, from 6-7 pm, central time. I'm doing it so that every other minority in town will be able to do this from now on, whenever the holiday is, because Hanukah is really a minor one in December, but it is about religious freedom. I have invited every supportive group in town I can think of so that this is peaceful and fun. The Unitarian choir is singing with me. I'm pretty nervous. I've asked for a police presence. There's a Klan here in Kentucky. However, this is what it means to stand up for what you believe in. Any cyber support is deeply appreciated. It's been crazy around here. It's the end of the semester, and my husband's a professor, so that is always chaotic. Then, sadly, we lost my husband's grandma, Bubbe Shirley Marcus, z"l. She passed away last night. She was a strong, funny, feisty lady who made it through something like 11 years of running away from Nazis and from WWII. Her story is scary and long and heroic. When she finally came to the USA in 1950, with her husband and children, she was only just my age, in her early thirties. Her passing will leave a hole in our lives. Of course, in the short term, it meant that my husband had to leave home at 3:30 in the morning to catch a 6 AM flight, because we live 70 miles from the airport, and in the end he didn't make it to the Northeast in time to get to the funeral anyway because of flight delays. Bubbe was the realist amongst us, though, she would say, "You can only do what you can do..." meaning, you always try your best, but sometimes life gets in the way. It's strange, I find fiber oddly comforting at times like this. Bubbe was an amazing seamstress and could make a dress simply by looking at one in a shop window. She didn't need patterns. How is this related? My husband's family felt that Bubbe and I shared our excitement about fiber, even though we expressed it in different ways. I got some alpaca in the mail from mythic alpacas and it is some amazing stuff. I have a pound of black fiber from, get this, Prada,--with a name like that, it has to be the good stuff, ehh? A pound of fawn fiber from Odin and two pounds of white alpaca from a guy named Aussie Jack. This alpaca has an incredibly low micron count and is so fine it is like sticking your hands into a little bit of cloud fluff. I am in love. I also have no reason to spin it all right now, no commissions and piles of handspun in the corners of my office, but it seems enormously comforting so I may have to anyhow. I've been spinning some cotswold and silk, but it feels cold compared to that alpaca, it might just have to be put on hold. Bubbe Shirley would always make sure to tell us, "We should only meet next on happy occasions," whenever we saw each other at family events, happy or sad. She loved seeing her family, but hated when sadness brought them together. She'd switch from English to Yiddish to Hebrew, depending on what languages you knew, she always wanted to confide something special in a language she thought maybe everyone around her wouldn't know; she also spoke Polish and Russian and probably German, although she never used those languages around me. I hope the rest of her family is celebrating their time together now, and remembering how lucky they were to have a Bubbe who fed you clear chicken broth with kreplach and pletzel and made everyone feel like a part of her family and her home. I feel lucky to have married into a family that had such a special Bubbe. A question came up about the Canadian Production Wheel--yes, it is a 30" wheel. I have no idea about the ratios, because it is a genuine Aan-ti-que, they don't come with booklets and I'm too lazy to count the rotations of the wheel. In the cold wintery months of early 2003, I was living in Buffalo. Husband was off interviewing in Kentucky, but I decided to go to a nearby auction. On the way, I slipped on some black ice and one whole side of my jeans and coat were soaked. This did not stop me--I went to the auction anyhow, icy leg and all! It turned out to be some very lovely collections of old stuff, but I had eyes only for this spinning wheel. I bought it for $140, including the auctioneer's fee, and spent the weekend tuning her up. It's taken a bit of time and love to make her hum, but she does sing now. 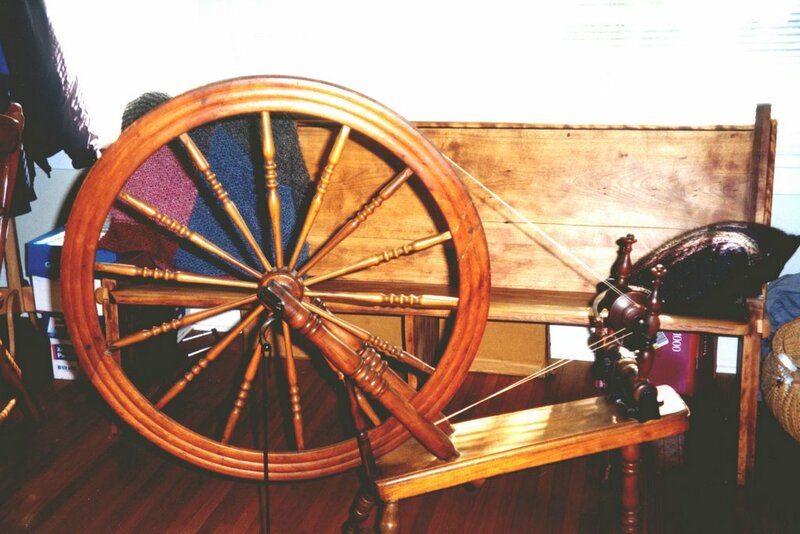 This wheel doesn't have a big bobbin and it spins dk weight yarn or finer; that's it. I don't even usually ply on it. The blue merino/silk handspun yarn in the photo is spun on the Production Wheel but plied elsewhere... That's ok, I have a Schacht single treadle and a Majacraft Little Gem in my office for everything else, and even another antique, a primitive Great Wheel that doesn't get used much. I always find myself rattling around this time of year, because my work life seems to slow down dramatically. I try to keep myself motivated and sending out submissions, but I don't get many responses while everyone's off at the office party drinking eggnog! 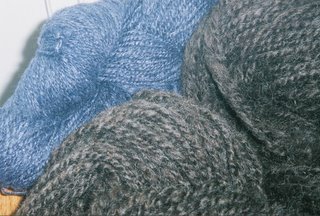 In the meanwhile, I've done the edits on a couple of sweater designs for Knit Picks, spun and knit a hat for a farmer who gave me some fleeces last spring, and worked on some knitting for me. I'm still working on the never ending Romney pea coat, this is a handspun, handknit coat that I hope to wear in the winter time...someday. The Romney ram fleece I'm using is from the aforementioned farmer. The ram was over 300 lbs and the fleece was 12 lbs+ when it was raw, over 8 lbs washed and carded! I'm knitting it very densely with a size 7 needle and it is slow slow slow. 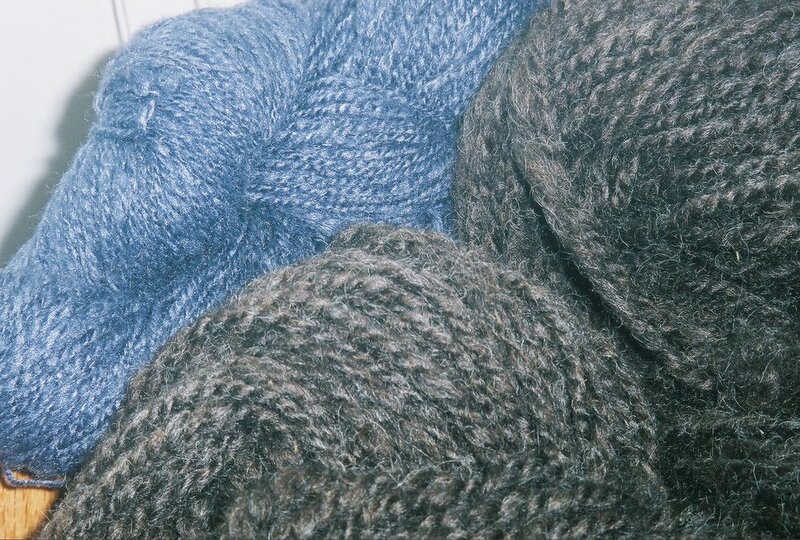 You can see that handspun in the photo, too, it a brown gray bulky weight yarn that looks just a bit too gray in this picture. I've also been working on a sweater "renovation," some nice mindless stockinette. Perhaps 8 years ago, I made myself a very short, practically empire waist cardigan out of handspun. I no longer wear it because, well, my tummy gets too cold! I'm putting on an addition--I picked up the stitches at the bottom of the cardi to add length and warmth. It's supposed to snow here in Kentucky tomorrow--I can't wait! I miss snowy winters. We have the cold temperatures; it was 19 degrees F while I walked the pooches this morning, but maybe only one snow a winter. I hope it's a good one! Suzanne says that this is a dogblog, not a yarnblog--but it's where I spin yarns...and sometimes they are about fiber! I found out that Harry does know how I feel about my Canadian Production Wheel. We had a guest over for Friday night dinner. Brian usually makes a huge fuss over Harry, but last night, he wanted to make friends with Sally. She was being coy. All went well until right before the guest got ready to leave. Brian went to say goodbye to Sally. Harry lifted his leg and... peed on my Antique Canadian Production Spinning Wheel. Yup. We can only assume he got insanely jealous and went for the negative attention route. He was whisked out of the house without comment while I said goodbye to the guest and then cleaned up a large puddle. I still hold a grudge, but since negative attention isn't helpful, I'm restraining myself. Good thing I always thought spinning wheels were beautiful tools for spinning and not major works of art. Oddly, the cast-iron treadle looks all shined up--who knew? Boy Dog pee. The newest cleaner? Too Gross. PS: Yesterday I replaced my own CD drive with a new one, and it works. Who knew a computer could get that dirty inside? Yuck. I'm pretty proud of myself, never thought that CD whirr would be so exciting! Hmmm, I'm still working out the kinks in this blog thing. At the same time, my CD drive decided to die, so I get to learn to install a new one later. This is the downside of working from home--there is no IT guy on call to help, and the relatives do have other things to do than wait on me and my computer problems... upside is that I learn to fix things myself. I know, I know, all of y'all thought that it was imaginary yarn since you've never seen it. Believe me, I've wondered that too, but then I notice the boxes of it stashed around the office so the dogs can't play with it. If the dogs can see it, it must exist. Lest you think I am always referring to works of literature or Descartes, I'll tell you that I originally named the story "Jocko's" and the editor decided on something more, shall we say, literary.